HOW TO: Jailbreak iOS 4.2.1 With Redsn0w 0.9.6b4 - iPhone.MY - Daily News On Mac, iPhone, iPads, iPods and more! 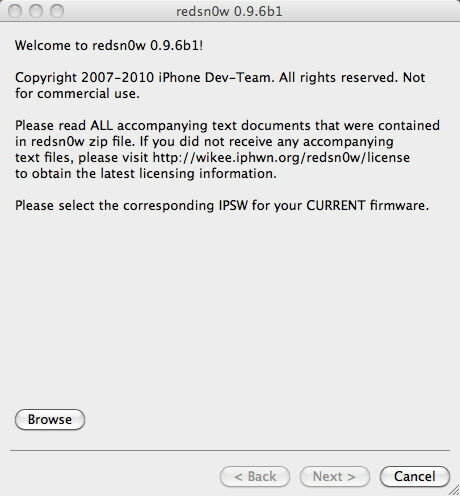 Today, the iPhone DevTeam released a new update to redsn0w which will jailbreak iOS 4.2.1. Well yeah, but don’t get too excited, because most of iOS devices will have a tethered jailbreak. Read carefully before using this tool…. NOTE: using redsn0w you will upgrade your baseband therefore you won’t be able to unlock ( possibly ever ). If you need to unlock your iPhone, don’t even think about using this tool. NOTE: read everything carefully. If you don’t understand the process, or something might be a concern to you, just be patient and do not use this tool. NOTE: the process is identical on both Mac OSX and Windows, and also identical with previous redsn0w releases. The images used in this tutorial are from previous redsn0w tutorial, so do not be alarmed. Read the text though… don’t just stare at the pretty pictures. If you have an iPhone3G, older iPhone3Gs, and non-MC iPod Touch 2G you are good to go. 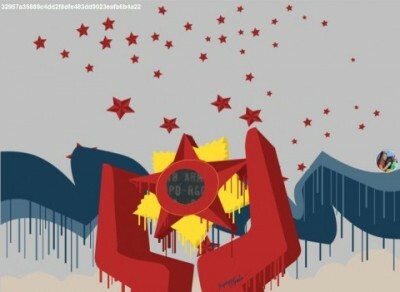 The jailbreak will be untethered. 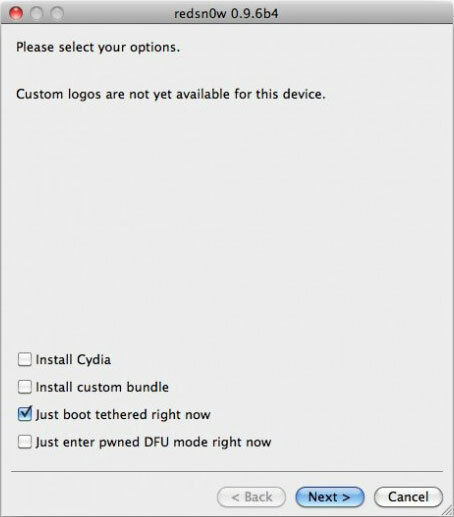 If your iOS device is not in the list above, you can still jailbreak it, but you will have a tethered jailbreak. 4. On the next screen select what you want to be installed on your iOS device(s). 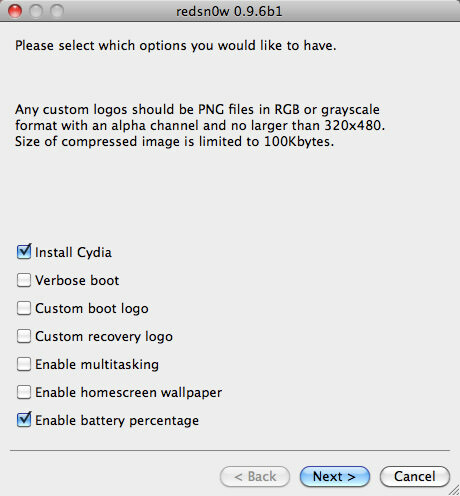 By default, Cydia and ‘enable battery percentage’ is selected. I suggest you deselect battery percentage and everything else, and just install Cydia. 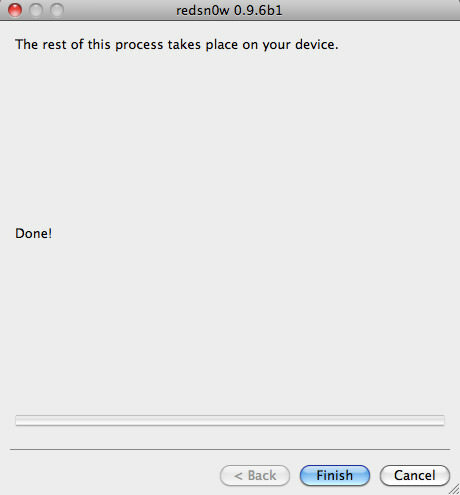 This will improve ( a bit ) the overall speed of your device – if you are on a iPhone 3G. If you choose to “Enable battery percentage”, you actually toggle that off and on via Settings->General->Usage. 6. 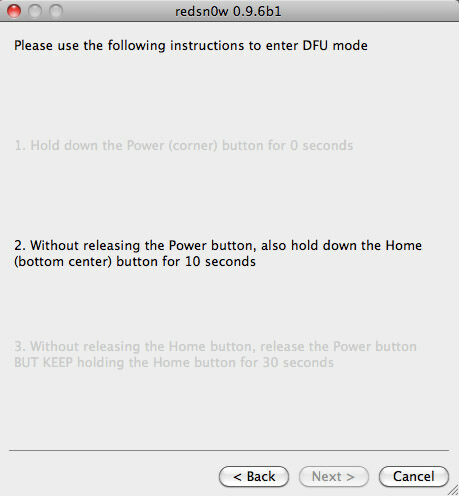 Now, you will need to put your device in DFU mode. Follow the instructions on thescreen. 7. Wait a few seconds for redsn0w to do its thing, and you are done. You can close redsn0w because everything else it’s happening directly on the device. NOTE: Any Windows users seeing “Waiting for reboot” for too long (more than 20 seconds or so), please try “shaking” the JB process by unplugging then replugging your USB cable (while letting redsn0w continue to run). 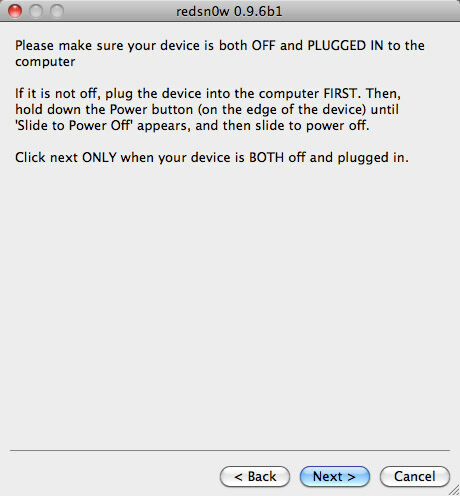 Also, try using a USB port “closer” to your computer (as opposed to on your monitor or behind another hub). iOS 4.3 rumored for December?